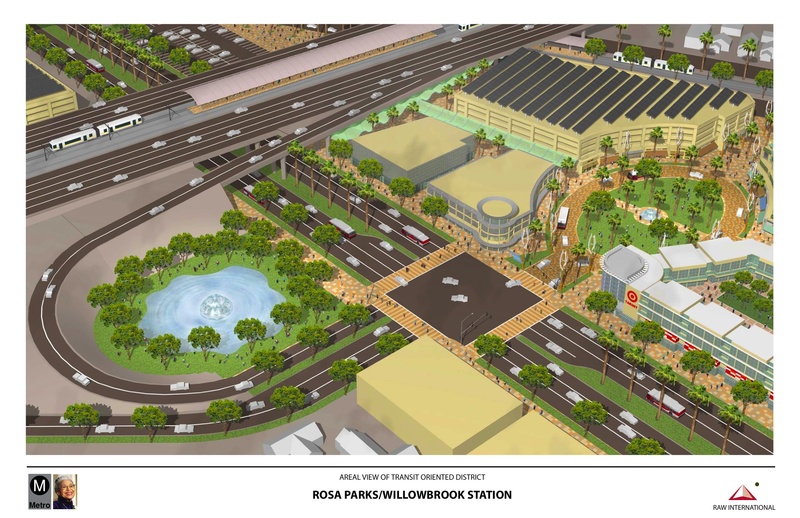 The Metro Board of Directors on Thursday approved a motion by Board Members Mark Ridley-Thomas and Diane Dubois to continue to develop a master plan for development at the Rosa Parks/Willlowbrook Blue Line station. The motion is posted after the jump. Here are renderings of what potential development may look like. funded through a Caltrans Community-Based Transportation Planning Grant. goals for developing the surrounding area as a Transit Oriented District. educational resources located in the Willowbrook community. Plan and Transit Oriented District as the guiding document for the Station. outlined in the Station Master Plan and Transit Oriented District. I find it most difficult to figure our where the actual entrance – elevators/steps/escalators – will be located to access the Blue Line light rail in the first two drawings. I see the 4 artistic ovals and also the sign Willowbrook, however no easily visible M – Metro station signage. Will future renderings position the station entrance in relation to the overall plan renderings? I can see it – http://bit.ly/euCIau look for the onramp and the rest will folllow. This is a great idea – i wish they could get it done in the next two years the current area is sad and miserable. Add a sound wall to the green line station and it’s a #WIN! Suggestions: the Blue Line seems hidden by the large building. Make the train a more focal portion of the development, or at least more visible. Don’t let cars/buses go in the loop — that should be a public plaza. The buses could utilize stops on the islands of the road or traditional curbside stops (both would be improvements over the loop). I would love to see something like this built. this is pretty cool considering how close to the freeway it is, and especially compared to what’s there now. the biggest problem is going to be bringing the Blue Line into the picture. but, I’m thinking there’s a level of the Green Line station which is below the Century Freeway but above the Blue Line (street level). It ought to be possible to use the Green Line entrance to get to the Blue Line. Going up and over to literally bridge the gap, and walk down to the Blue Line platform. Since the station is a terminus point for many bus routes, a loop is required for them to layover and turnaround. I don’t see anything about how the Blue Line platform will be improved. Currently the Blue Line platform is incredibly dark and gloomy due to its location under the freeway. How about some greatly improved lighting? 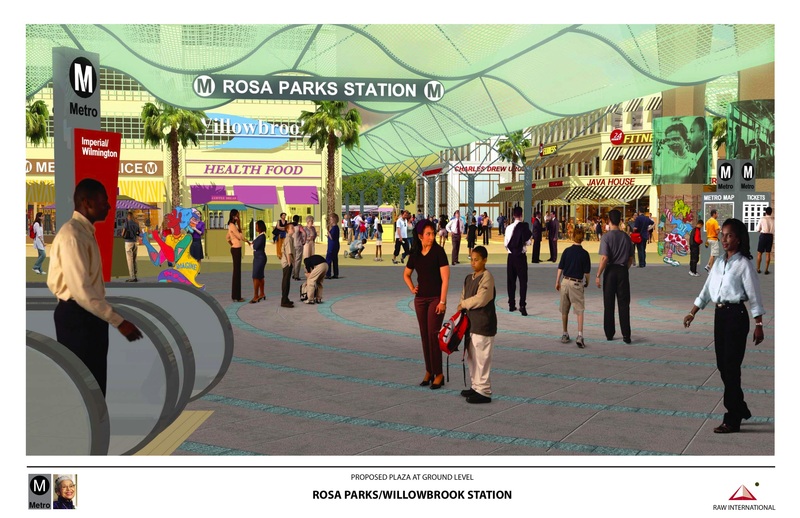 So, now its going to be the “Imperial / Wilmington – Rosa Parks – Willowbrook – Green Line – Blue line transfer” station?? That’s a lot of names. How about we stick with “Rosa Parks”, and drop the other names. I love the idea of better development around the station, but it would be nice to see a more pedestrian-oriented design. I see a huge, 4-story, block-sized parking structure, a big bus turn-around, and a wide, unfriendly street (Wilmington). Seriously, who will drive and park at this station? Why not plan to build some residential apartments in that space, instead of a huge subsidized parking garage? I like “Rosa Parks/Willowbrook” for the station name. It is short and sweet. 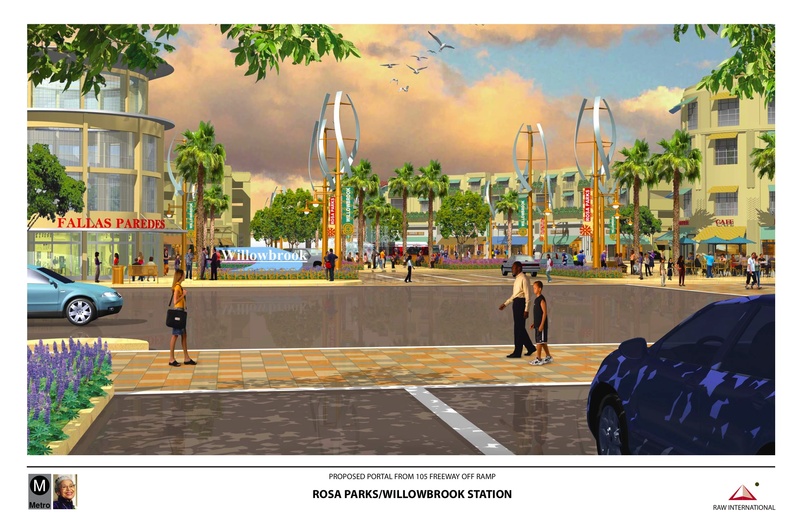 And it includes the commemorative name (“Rosa Parks”) and the neighborhood name (“Willowbrook”). “Imperial/Wilmington” is too much detail for the name of this station. Most people transfer here, so they don’t need to know the cross-streets. Yeah I gotta say, not bad considering the freeway. Although I do agree that the blue line should be more obvious. Key thing to remember in terms of the cars is that it is still in a part of Los Angeles with suburban elements to it. So some people still always going to park and ride and they are still an important part of Metrorail’s usage. So accommodating that is not so bad, just so long as its not the primary design feature of the whole station development. I think its a great idea. It would be so nice to be able to actuly shop there. Without feeling that your deep in the hood. First off I’d like to commend those who put together a plan to address this neglected region of the Metro Rail network. Finally the Blue Line receives some attention where it’s most needed, its second biggest transfer point. Rosa Parks. I like the streamlined name and what the grand vision of this plan is, but I hope that access to the Blue Line station is also improved (as in it should be overall more visible rather than hidden) as is the dark setting on the station platform under the bridge as well as the possibly providing a barrier from the deafening sound of highway traffic on the Green Line platform. This could become a destination in its own right rather than a sketchy transfer point. I love the idea. Security issues are big in the area. Willowbrook must again be put in the map! That’s an interesting way of putting it, I am not sure if I agree.